Note – this is not our fridge. No way I would waste beer space on 4L of soda!!! When we ordered our Norcold 410 RV fridge I was more than a little nervous. Not because of the size – I knew that I could deal with a small fridge – but because of the cooling capacity. Would we have enough energy to keep things cool? 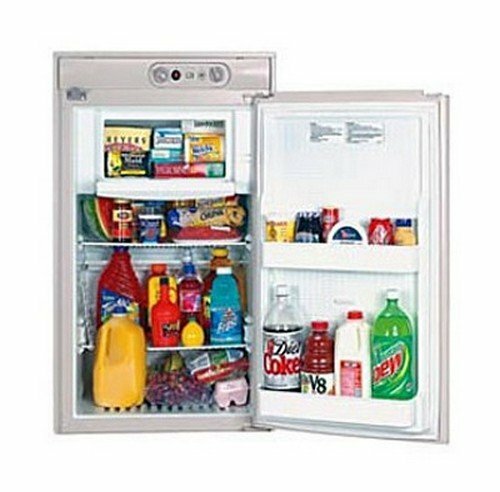 Would the freezer be totally lame, à la my college dorm minifridge freezer? My feelings were especially impacted by the big price tag – at $1,010.06, this baby was one of our biggest purchases. My second bout of nervousness came when our RV contractor pointed out that I’d installed the vents wrong… the upper vent was about 6″ too low. Damn. He cautioned us that it’s really important that these things have enough ventilation, and then told us we’d probably be fine if we added an electronic computer fan to help facilitate the airflow. Is there enough room for all of your food? Yes! But I think it depends on how you shop. I’ve always been more of a European shopper, preferring to visit the grocery store at least once a week and often again to refill on produce – I love the fresh stuff! If you’re making a monthly trip to Costco to buy the double gallons of milk, this will not work for you. You get the idea – there’s a lot going on in there. It all fits, with some superior organization skills. The freezer is great. It freezes meats, ice cubes, ice creams… you name it. There’s a good amount of room in there too, more than you would expect! I’ve hated “in fridge freezers” before, but this one is in a class of its own. This RV fridge is a combo: it can run on either 110v electric or propane. We almost went full electric, but I’m so glad we sprung for the propane. We only power the fridge on electric power while we’re driving, which usually means we’re in full sun and can take full advantage of our solar panel setup. However, the fridge draws so much power that we can only keep up in the most ideal solar conditions. The propane, on the other hand, is super efficient. We turn on the propane whenever we’re stopped for more than a few minutes. To give you an idea, our 25 gallon propane tank powers the fridge, stove, water heater, and furnace. We use all very liberally, and the tank lasts about a month and a half before we need to fill it again. Not bad! Is there an aspect of #buslife that you’re especially curious about? Let us know in the comments, and we’ll answer next Thursday!